Israel's military is pressing on with an expanded ground offensive in south Lebanon, despite the UN Security Council vote for a ceasefire plan. Israel has tripled its number of troops there, the army chief said. They are moving towards the strategically significant Litani River. The UN passed a resolution urging a "full cessation of hostilities". Israel's Cabinet is to discuss the issue on Sunday and will only halt military action after it takes a vote. Israeli Prime Minister Ehud Olmert is asking the Cabinet to endorse the resolution, describing it as positive and acceptable. But even as diplomats finalised the draft, Israel radio said troops had been ordered to seize ground as far as the Litani River, up to 30km (18 miles) from the Israeli border. Israel's army chief Dan Halutz said that with the new offensive "we have multiplied by three the number of our troops operating in Lebanon". Israeli government sources say they believe Israel's Cabinet will approve the UN resolution this weekend but that it may take some time to implement. Hezbollah also fired more rockets, hitting a house in northern Israel and causing casualties, AP news agency reported. Long columns of tanks and troops crossed the border under cover of darkness, reports from northern Israel said. According to Lebanese security sources, at least five people were killed in Israeli air strikes in a village near Tyre. 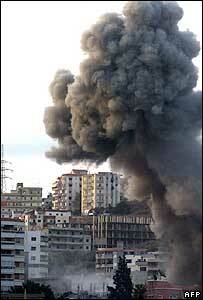 Israeli jets also raided the city of Sidon - north of the Litani River - destroying facilities at a power station. It is only the second time Sidon has been hit in the conflict, which began more than four weeks ago. The UN special envoy to the Middle East, Alvaro de Soto, said he expected Israel to wind down its operations in the next couple of days. No timetable has been agreed for a ceasefire yet. An adviser to Lebanese Prime Minister Fouad Siniora gave the resolution a cautious welcome, but there was no immediate reaction from Hezbollah. Lebanese Information Minister Eli Farzli told the BBC Hezbollah would abide by the terms set out at the UN. "If the implementation of the resolution takes place accurately, and the Israelis stick to the resolution, and if the Lebanese government accept it, then I think it means that Hezbollah will also accept it, and I think that Hezbollah will stick to the 1701 resolution," he said. The Lebanese Cabinet is also due to discuss the issue this weekend. 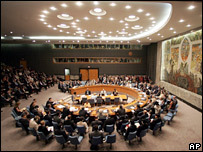 UN Security Council resolution 1701 was passed unanimously in New York after an impassioned speech from Secretary General Kofi Annan. He lamented the UN's failure to act sooner to end fighting in the Middle East. He also said the widely perceived delay in drafting a resolution had "badly shaken" global faith in the UN. The new resolution says Hezbollah must end attacks on Israel while Israel must end "offensive military operations" in Lebanese territory. Drawing up of plans for the disarmament of Hezbollah and the final settlement of the Israel-Lebanon border area, including the disputed Shebaa farms area.